Dauphin Clinic Pharmacy continues to be a proud corporate sponsor of Dauphin's Counfryfest 2018. 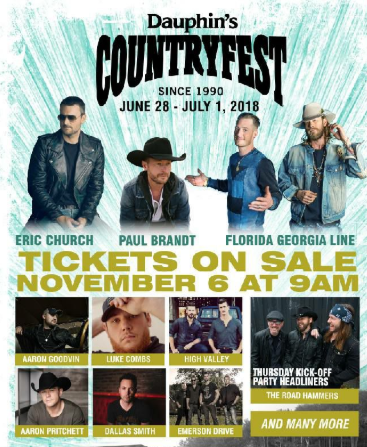 There is a great line up this year featuring Eric Church, Paul Brandt, Florida Georgia Line, Dallas Smith, High Valley, Aaron Pritchett and Luke Combs just to name a few. All the organizers and countless volunteers help to make Countryfest such a success! Wishing you all a safe and fun filled July long weekend! Happy Canada Day!